On 27 January the Persian Minister visited ‘Abdu’l-Bahá even though the Master had a fever and was not sleeping well, and two days later ‘a visitor was announced whose presence there was most astonishing’. This was Rashíd Páshá, formerly the Válí of Beirut, who had been very hostile towards ‘Abdu’l-Bahá in ‘Akká. Describing this episode later, ‘Abdu’l-Bahá said of Rashíd Páshá that he ‘must have been bad even before Adam and Eve’. He had used any excuse to extort money for those under his dominion. He also acted as a spy for the Sultan, sending in ugly fabrications about honest citizens in order to enrich himself through bribery or extortion. At one time, a secretary of the Turkish Embassy in Paris met Madame Jackson, a devoted Bahá’í, who told him about ‘Abdu’l-Bahá’s unjust incarceration in ‘Akká. The secretary happened to be a relative of Rashíd Páshá and also fond of money, so he told Madame Jackson that it would require £3,000 to free ‘Abdu’l-Bahá. She said that she was willing to pay the sum if ‘Abdu’l-Bahá was freed. The secretary reported this to Rashíd Páshá, who immediately began scheming. Meanwhile, ‘Abdu’l-Bahá learned of this from the Mutasarrif of ‘Akká, who explained to Him the whole story. ‘Abdu’l-Bahá immediately cabled Madame Jackson: ‘Beware! Beware! lest you pay one cent for my freedom. In prison I am feeling happy!’ When Rashíd Páshá heard of this, he was furious, having expected to make some easy money. Thinking that ‘Abdu’l-Bahá couldn’t possibly wish to remain in prison any longer than necessary, he had his secretary write the Master a letter saying that he was anxious to see Him freed. ‘Abdu’l-Bahá did not reply. Another was sent saying that a petition was being drawn up requesting the Sultan to grant ‘Abdu’l-Bahá His freedom. Again ‘Abdu’l-Bahá did not answer. There followed another letter saying that the petition was ready to be mailed. Still‘ Abdu’l-Bahá did not answer. Yet another letter was sent saying that the Governor had read the petition and ordered that it not be sent. 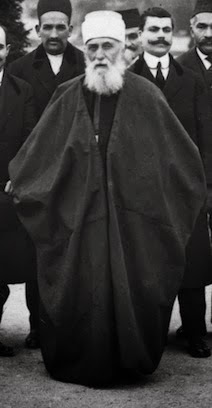 ‘Abdu’l-Bahá remained silent. As a last resort, Rashíd Páshá sent his son to persuade ‘Abdu’l-Bahá. When the son arrived in ‘Akká, the Mutasarrif hosted a lavish dinner to which he also invited ‘Abdu’l-Bahá. After dinner, the son tried to convince the Master to accept His freedom and said, ‘I am sorry to see you in prison’. ‘Abdu’l-Bahá replied, ‘Here I am happy’. The next day, as the son prepared to return to his father, he bade farewell to ‘Abdu’l-Bahá saying, ‘I hope, my Effendi, that I shall see you next time in Haifa’. ‘Abdu’l-Bahá ‘waved the matter aside’. When Rashíd Páshá heard his son’s report, he felt humiliated. Everyone else in Syria trembled in fear of him and his decrees were law. One word from him to the Sultan would bring the Sultán’s wrath down upon anyone, regardless of position or power. But he couldn’t forget the £3,000. Do not make any more intrigues; you shall fail in all your secret machinations. There is a destined period for my imprisonment. Before the coming of that time, even the kings of the earth cannot take me out of this prison, but when the appointed moment arrives, all the emperors of the world cannot hold me a prisoner in Acca. I shall then go out. Rest thou assured of this. The Mutasarrif realized that ‘Abdu’l-Bahá was not to be moved and wrote that Rashíd Páshá should abandon his hope of gaining the money. Now that Rashíd Páshá’s power was gone, he was very reverential and contrite and the Master received him warmly, returned his visit that very evening. Rashíd Páshá made several more visits. Astonishing, indeed! Transformation is possible.